Along with a new site design, Formula1.com has added a new Technical Analysis section that has some pretty drawings. Just under 5 days left until the Australian Grand Prix. All the drywall on the ceiling is hung, only took us another 4 hours or so. When you are putting up whole 12′ sheets without cutting them, it goes much faster. 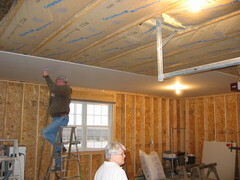 Now Dad needs to insulate the walls and find someplace to get 8’x54″ 1/2″ drywall so we only have one seam on the walls. If you’ve ever had the need to print a mirror image of a document (ie, text to put on a teleprompter), you know there’s no easy option in Microsoft Word to do it for you. And you’ve searched the web to find that the only choice is some rare versions of the HP DeskJet drivers that have “Mirrored Output” options. Don’t be fooled, there is another way! If you’ve got an HP LaserJet, go download the PostScript driver for it. Install them. Then, we you go to print, in Printer Properties, Click the Advanced button. Expand the PostScript Options section and set Mirrorer Output to Yes. I’ve done this with both a 4100 and an 8150, so it’s probably fairly common among the newer LaserJets. You are probably asking yourself how, or even why, I figured this out. Well, one of the people around here does video production and bought a low tech teleprompter set up last year. Of course, I write down how to do this, so I spent 45 minutes this afternoon figuring it out. Since my relatives like to ask me what tuition costs at the University now, here’s a nice page from the Office of Admissions and Records with all the stats. An article in the DI and another from the News-Gazette, about the recent drop in applications. Too bad there aren’t more pictures and/or video of the Silverstone testing, I bet 1000 horsepower cars on a snow covered track is pretty funny. Trying to figure out what all the 802.11blahblahblah means? One of the handlers at ISC has written a nice summary of the future letters. And there’s a nice one slide presentation from the IEEE as to what the earlier ones are for. Like the rest of lazy, couch potato America, I’m addicted to watching the dysfunctional family that is the Teutels. But, this Lincoln pickup truck bike episode is driving me nuts. They keep saying that this Lincoln Mark LT is the first pickup from Lincoln. I guess Lincoln really wants to forget about the overpriced bomb that was the Blackwood. Thanks to my father-in-law loaning us a drywall jack and a screw gun, Dad and I made some progress on finishing his garage. We spent most of Saturday and got just less than half the sheets on the ceiling, another day and we should be done. We aren’t fast, but at least it’s getting done. It seems grain elevators are the same design, the world over. possibly renting out portable USB ports. this would help with the transferring of memory from one computer to the next whether it be our own in our room, the ones in the lab, or someone elses. I consider the services offered excellent. No complaints. It would be nice if you had a stapler physically attached to the table so that we do not have to go searching for one after we print. Provide wireless routers to every URH dorm room, so that every URH dorm room could have wireless access to the University network.